Step 1. Begin with probiotic yogurt. 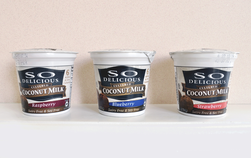 I use SO Delicious brand non-dairy coconut milk yogurt. Step 2. 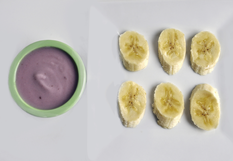 Using a spoon, dip banana slices (sliced at an angle for elongated discs) into a bowl of yogurt and coat both sides. Step 3. 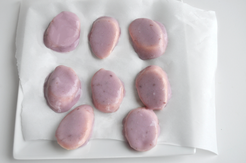 Put slices on parchment or wax paper or onto a freezer safe plate. Place in freezer to solidify (about 30 minutes). Step 4. 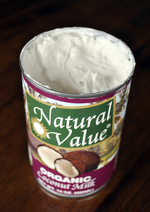 Use solidified coconut milk (solidifies by placing can in fridge for an hour or more) and dip the tine of a fork in the "whipped" coconut cream to use as icing. Step 5. Dot the icing onto the banana "eggs" to decorate. 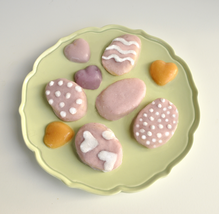 Final "eggs" shown here with frozen yogurt hearts - made by pouring yogurt or fruit puree into candy molds and freezing 30 min. or more.